There are so many technicalities and legal issues to consider when running a business that it’s understandable to feel overwhelmed. 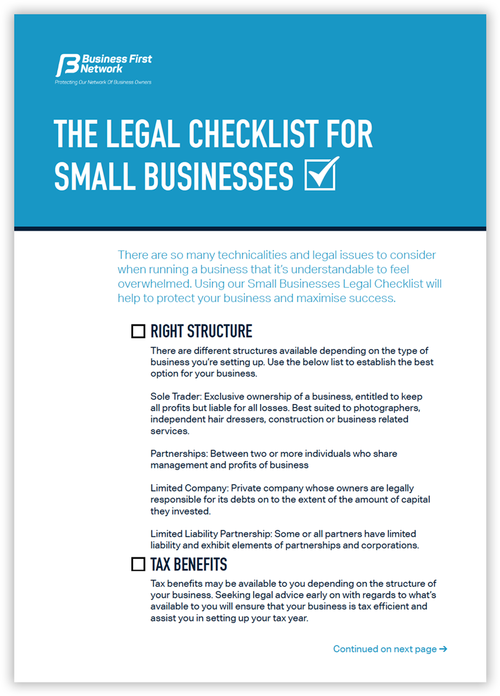 Using our Small Businesses Legal Checklist will help to protect your business and maximise success. There are different structures available depending on the type of business you’re setting up. 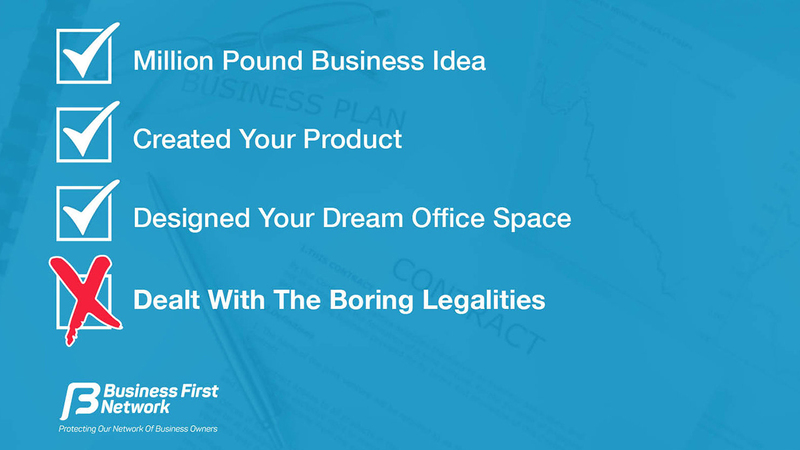 Use the below list to establish the best option for your business. Sole Trader: Exclusive ownership of a business, entitled to keep all profits but liable for all losses. Best suited to photographers, independent hair dressers, construction or business related services. Partnerships: Between two or more individuals who share management and profits of business. Limited Company: Private company whose owners are legally responsible for its debts on to the extent of the amount of capital they invested. Limited Liability Partnership: Some or all partners have limited liability and exhibit elements of partnerships and corporations. Tax benefits may be available to you depending on the structure of your business. Seeking legal advice early on with regards to what’s available to you will ensure that your business is tax efficient and assist you in setting up your tax year. As a business owner and employer you have a duty of care for anyone that might be affected by your business. This extends to the public, employees and visitors. You must carry out a risk assessment and upon identifying health and safety risks, you have a responsibility to mitigate these risks to the best of your ability. 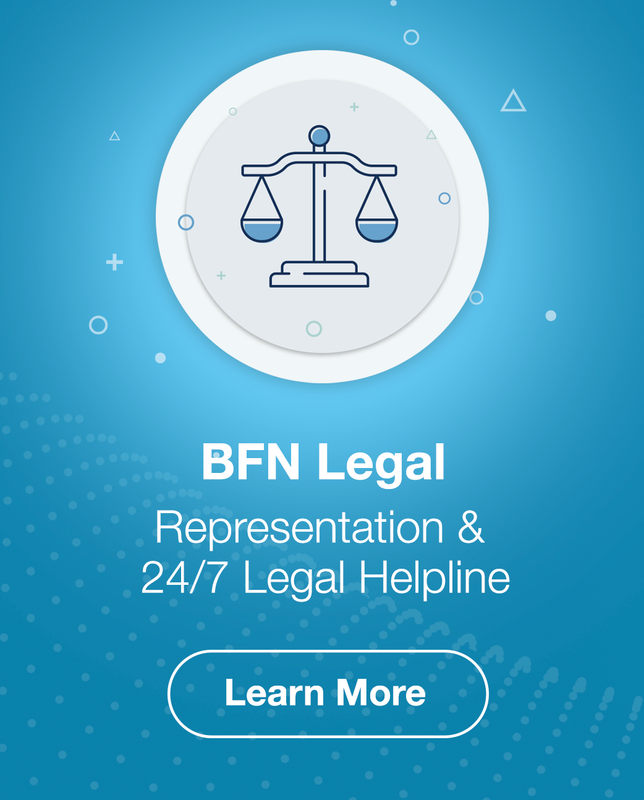 recommended that you take out business insurance that covers you in the event that you lose your license, particularly if you rely on licensing for income. If you intend on hiring staff you are legally required to have employers’ liability insurance cover. Without this you leave yourself vulnerable to compensation claims from employees who suffer injury or illness directly related to their work as well as a significant fine for every day that you go uninsured while in business. Other insurance covers such as public liability or professional indemnity, while not legal necessities, will help to protect your business from potential compensation claims. These claims can be incredibly costly to a small business so it’s key that you are properly covered for all circumstances. All of these can be covered within one business insurance policy meaning you’ll save precious money while still at the start up stage of your business. Your legal obligations to the taxman vary depending on the structure of your business but you can expect to have to file at least one annual return and paperwork is guaranteed to significantly increase if you take on staff. You also must take VAT registration into account, a legal obligation you have as a business owner if your annual turnover exceeds the registration threshold (more than £85,000 for the 2017/18 tax year. Significant penalties apply for those who fail to register in time. Imagine putting all of this work into your dream business only to have your product or idea stolen by someone else because you didn’t take the appropriate steps to protect your business. This is where Intellectual Property Protection comes in. Find out in advance which of these are appropriate to apply copyright, patents and trademarking to in order to protect your business venture. It’s impossible to run your startup without employee contracts. These are necessary to outline the rights and responsibilities of your employees. As an employer they can protect you against employment tribunals and defend your business through confidentiality clauses, restrictive covenant and general breaching of contract by an employee. Use these documents to dictate the relationship between your business and consumers and avoid serious lawsuits in the long run. Privacy policies and disclaimers limit your responsibility as a business if something goes wrong for a consumer when using your product or service. It’s necessary protection for your business to have these statements visible and terms made very obvious to all customers. You never know when something might go wrong within a business and with the taxman in particular holding a magnifying glass over your business it’s crucial to keep track of all documents. You need to be able to safely store and document all tax records, payments to contractors and employees, investment funding, confidentiality agreements etc. Make sure you cover all of your bases and you’ll have nothing to worry about.